Saturday 11th June was a rather eventful day for me, I flashed in public! 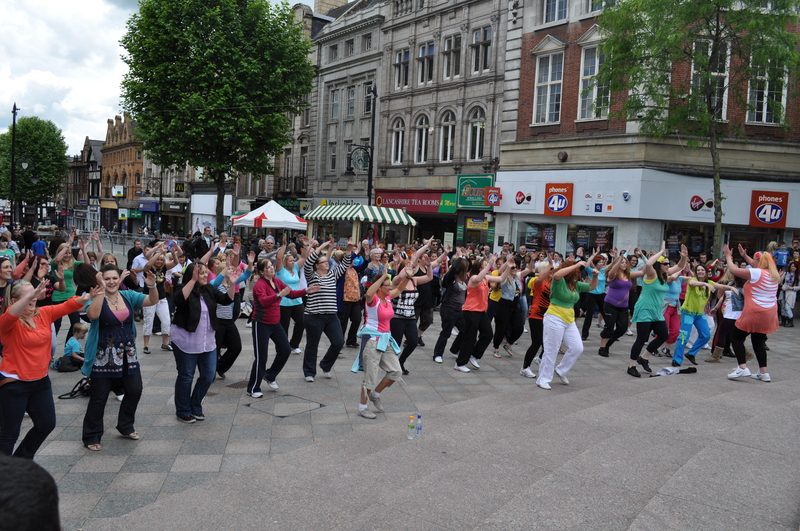 Now before you shriek and wonder for my sanity, do not panic, it was a ‘flash’ of the mob variety, and was organised by three Zumba instructors in Warrington. A flash mob (or flashmob) is a large group of people who assemble suddenly in a public place, perform an unusual and pointless act for a brief time, then quickly disperse. The term flash mob is generally applied only to gatherings organized via telecommunications, social media, or viral emails. In this case the event was organised via Facebook, the flash would begin at 2.30pm, we were to mill round ‘acting natural’ then suddenly music would pump out and the three organisers would break into one of two routines which we’d all gradually join in with. Plans were discussed at the Zumba class I attend and we practiced one of two routines we would be performing on the day, the second (which we’d never done) “was easy and we’d pick it up no problem” eek! We gathered in a town centre car park and practiced ‘acting natural’, easier said than done when you know you’re about to break into an unexpected dance routine in the middle of town. As the first track ‘Caipirinha’ (which was the official anthem of the 2010 instructors convention) began to play the three instructors took their places and started the routine, gradually more and more people joined in until there were approximately 80 people all shimmying and wiggling about. My friend Michelle and I giggled the whole way through, Michelle was in a state of disbelief that she was actually dancing in public, in the middle of town and stone cold sober! Once we got past the nervous laughter we really started to enjoy ourselves, as the second song ‘Party Rock Anthem’ kicked in we began to notice just how many people had stopped to watch, it was unbelievable, everyone was either taking pictures/videos or just staring open-mouthed whilst looking a bit bewildered. I think I need a large glass of Pinot Grigio! As soon as the final beats of the song had faded away we quickly dispersed as though what we’d just done was a perfectly normal Saturday afternoon activity. We were on such a high afterwards, I’d highly recommend anyone to get involved in a flashmob, it may terrify, delight and confuse all at the same time but one thing it most certainly will do is entertain. 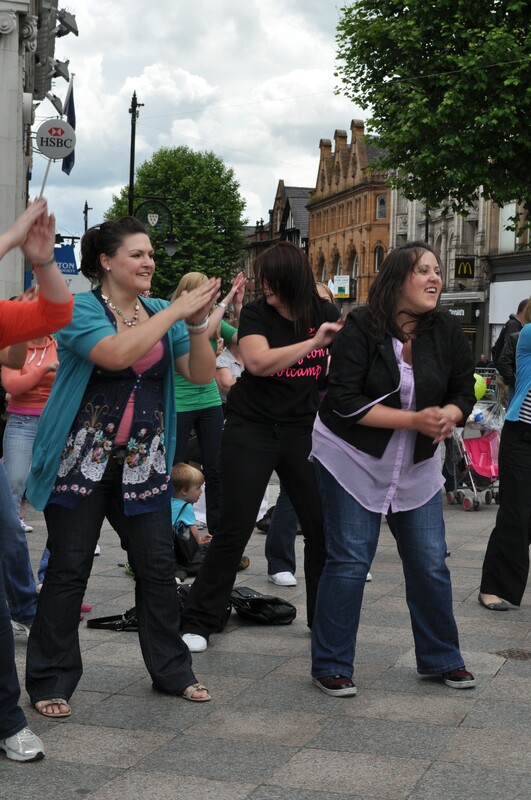 This entry was posted in Zumba and tagged Body Rock Anthem, cheshire, Dance, flashmob, gym, Warrington, Zumba. Bookmark the permalink. 1 Response to Watch me flash on youtube!